From the Nature Storybook series from Walker Books, the beautifully produced Flight of the Honey Bee reflects on the intimate life and habits of one the most precious food producing species on our planet. The illustrations are created in gentle shades of watercolour, acrylic and coloured pencil upon a powerful background of gold. There are 50,000 female bees in a hive, with very few males. Detailed are the types of honey bees and the different roles they undertake, and the hard work they put into producing honey. ‘Bees need to harvest nectar from over two million flowers to make enough honey to fill a jar’. The focus here is on the Scout, who is also the leading character in the book, and whom we follow from page to page as he guides us through the honey bees’ life. There is narrative, then statistic; black markings on an extraordinary landscape of full page colour. The statistics are amazing. They open our minds to the tremendous fact that the world is more than we know. 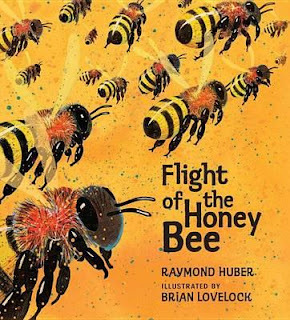 The vibrant yet delicately intricate depictions of the bees by Brian Lovelock upon splattered backgrounds, compliments his shift from a scientist who painted all his life, to illustrator of children’s books. This is a worthwhile collector’s treasure which can be revisited, used as a reference in libraries and schools, or simply enjoyed for the sheer beauty of its contents, both illustrative and verbal.